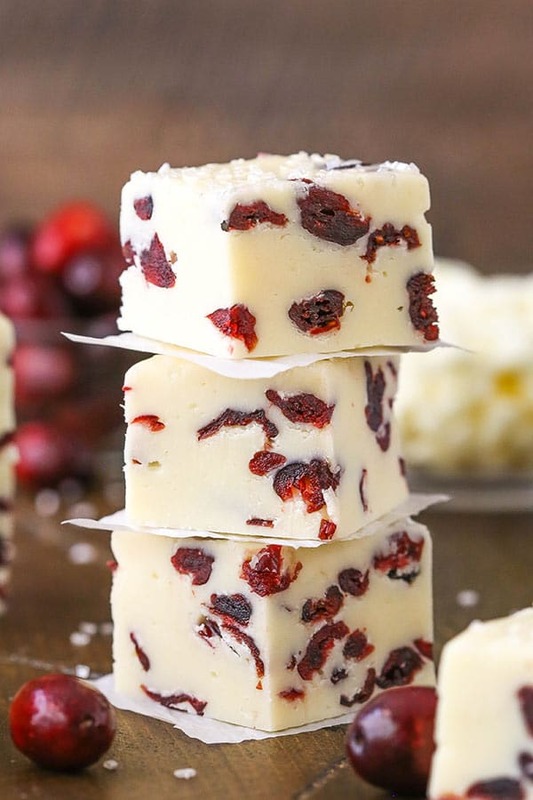 This White Chocolate Cranberry Fudge is made with sweetened condensed milk and dried cranberries! With beautiful Christmas colors, this super easy and quick dessert is a great treat for the busy holiday season! So I’m doing something new today and I’m totally excited about it – fudge! 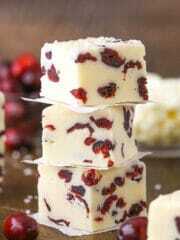 And I’m starting off easy with this White Chocolate Cranberry Fudge. 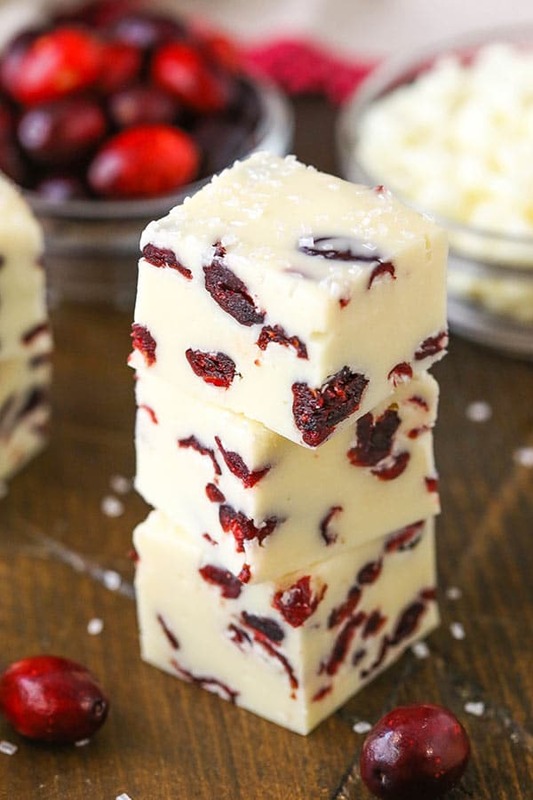 White chocolate and cranberries are easily one of the best holiday flavor combinations, so having a quick treat to put together is a must. Plus, I wanted to make it a little extra special with it being the holidays and all and I added some sparkling sugar to the top. 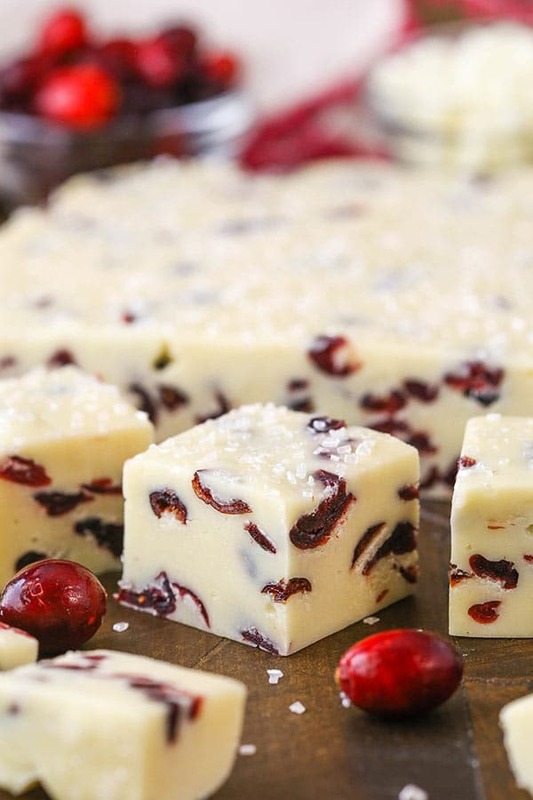 it takes this Easy White Chocolate Cranberry Fudge and turns it into SPARKLING white chocolate cranberry fudge. And who doesn’t love a little sparkle at the holidays?! It makes this fudge would perfect for gifting or for holiday dessert trays. One of the best things about this fudge is how easy it is to put together. 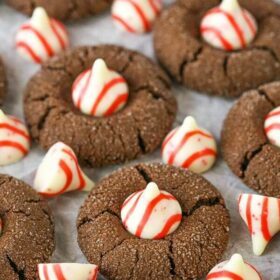 With only 5 ingredients, plus some sprinkles, it keeps things nice and simple. All you need is a bowl, a 9×9 inch pan lined with parchment paper and your microwave. Start off by adding the white chocolate chips and sweetened condensed milk to a large microwave safe bowl. Microwave them for one minute, then stir to combine and let the residual heat do as much of the melting as it can. If it needs another 30 seconds or so, go ahead and heat it some more, then stir it until it’s melted. Once melted, add the vanilla extract, cranberries and a pinch of salt. Use a spatula to combine everything and then quickly pour into the prepared pan. Add the sparkling sugar sprinkles, if you want to use them, and press them into the top of the fudge. Let the fudge cool to room temperature before cutting into squares. You could also let it cool in the fridge to speed up the process, but it doesn’t have to be refrigerated. 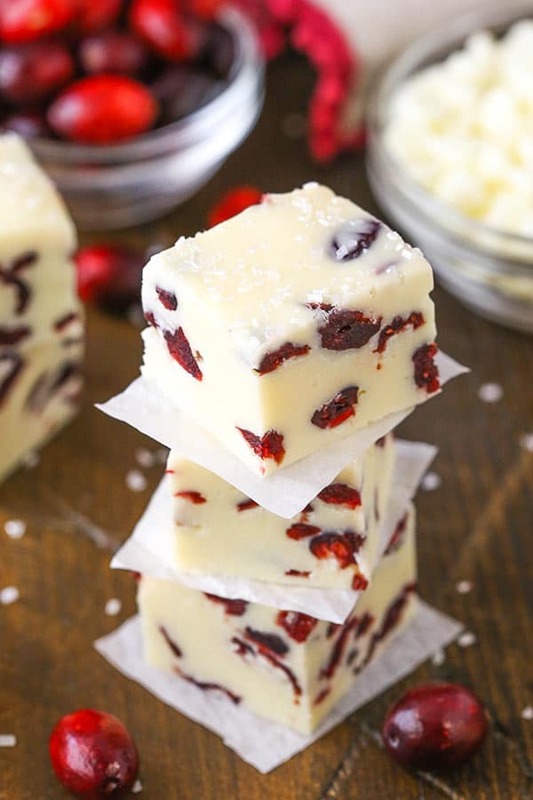 This Easy White Chocolate Cranberry Fudge is so simple to put together and tastes great! It’s smooth and creamy and plenty sweet! The tart pop of the cranberries is perfectly refreshing and cuts the sweetness down just enough. It’s such a perfect pair and festive fudge to try! 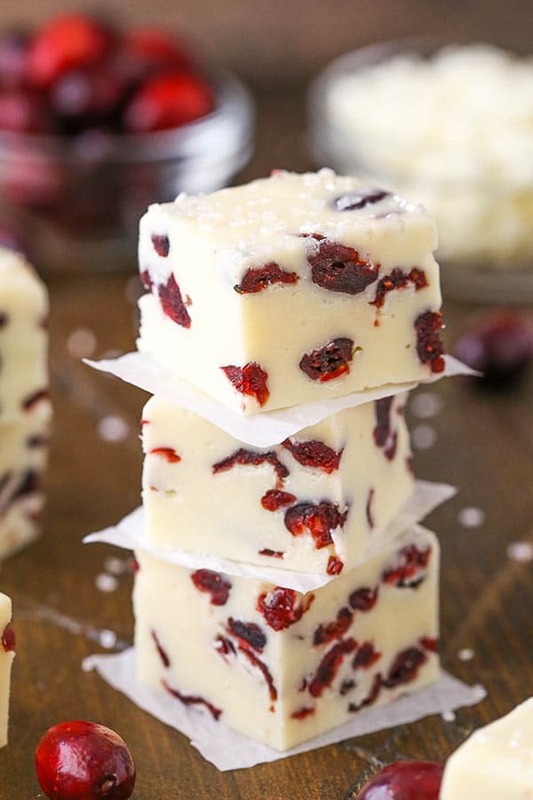 This White Chocolate Cranberry Fudge is made with sweetened condensed milk + dried cranberries! It’s a super easy & quick dessert with Christmas colors! 2. Place the white chocolate chips and sweetened condensed milk in a large bowl and microwave for one minute. Stir well to combine and allow the heat to melt the chocolate chips. If needed, microwave for another 30 seconds or so, until the chocolate is completely smooth. 3. Stir in the vanilla extract, dried cranberries and salt, then quickly transfer the mixture to the lined pan and spread evenly. 4. Top the fudge with some sparkling sugar sprinkles, if you’d like to include them, and press them down into the top of the fudge. 5. Let the fudge cool completely to room temperature before cutting into squares. You could also refrigerate it until it’s cool. 6. Cut the fudge and store in an air tight container. Fudge can be stored at either room temperature or the fridge. Hello, this fudge looks beautiful, and I love the tartness of cranberries. How long can this be stored, both refrigerated and not? Thank you! It should be fine for at least a week. Great recipe! Love Cranberries! So festive looking! How long do you have to refrigerate if you want to? How long do you have to leave at room if you want to? Thanks for sharing this recipe! I didn’t time it specifically and it would vary a little by the setting on your fridge or temperature of your home, but generally an hour or so in the fridge should be enough and a couple hours at room temperature. Just made it for a get-together and it was a hit. Couldnt believe how simple this recipe is. Do u you have to bake it or just melt the chocolate and let it cool in the fridge with all the ingredients? This is a no bake recipe. 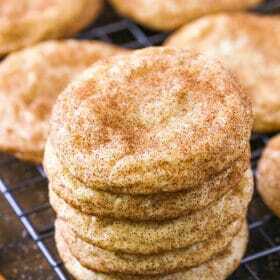 It can cool in the refrigerator or at room temperature. I made this recipe – easy but it doesn’t look as white as your picture. Hmm, maybe it’s the brand of white chocolate. I used Nestle Tollhouse White Chocolate Chips. Wonderful! So glad you enjoyed it! Merry Christmas! This was such a hit that I am making this for the second time! I’m thinking of making this but adding walnuts. Has anyone tried it with adding nuts? Not that I know of, but it should be fine.